Picture - X-1 #46-062, nicknamed "Glamorous Glennis"
The Bell X-1, originally designated XS-1, was a joint NACA-U.S. Army Air Forces/US Air Force supersonic research project and the first aircraft to exceed the speed of sound in controlled, level flight. 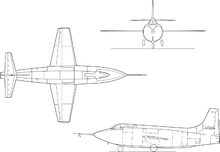 This resulted in the first of the so-called X-planes, an American series of experimental aircraft designated for testing of new technologies and usually kept highly secret. Picture - Chuck Yeager in front of the X-1, which he named Glamorous Glennis after his wife. 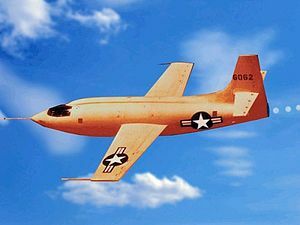 On 16 March 1945, the United States Army Air Forces' Flight Test Division and the National Advisory Committee for Aeronautics (NACA) (now NASA) contracted Bell Aircraft to build three XS-1 (for "Experimental, Supersonic", later X-1) aircraft to obtain flight data on conditions in the transonic speed range. The XS-1 was the first high-speed aircraft built purely for aviation research purposes and was never intended for production. The X-1 was in principle a "bullet with wings" that closely resembled the shape of the Browning .50-caliber (12.7 mm) machine gun bullet that was known to be stable in supersonic flight. The pattern shape was followed to the point of seating the pilot behind a sloped, framed window inside a confined cockpit in the nose. After the aircraft ran into compressibility problems in 1947, it was modified to feature a variable-incidence tailplane. An all-moving tail was developed by the British for the Miles M.52, and first saw actual transonic flight on the Bell X-1 that allowed it to pass through the sound barrier safely. 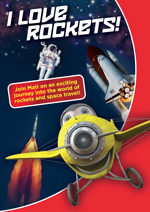 The rocket propulsion system was a four-chamber engine built by Reaction Motors, Inc., one of the first companies to build liquid-propellant rocket engines in America. It burned ethyl alcohol diluted with water and liquid oxygen. The thrust could be changed in 1500 lbf increments by firing one or more of the chambers. The fuel and oxygen tanks for the first two X-1 engines were pressurized with nitrogen and the rest with steam-driven turbopumps. 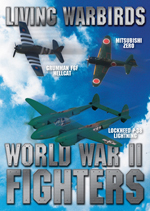 The all-important fuel turbopumps, necessary to raise the chamber pressure and thrust, while lightening the engine, were built by Robert Goddard who was under Navy contract to provide jet-assisted takeoff rockets. Bell Aircraft Chief Test Pilot, Jack Woolams became the first to fly the XS-1, in a glide flight over Pinecastle Army Airfield, in Florida, on 25 January 1946. Woolams would complete nine additional glide flights over Pinecastle before March 1946, when the #1 aircraft was returned to Bell for modifications in anticipation of the powered flight tests, planned for Muroc Army Air Field (now Edwards Air Force Base) in California. Following Woolams' death on 30 August 1946, Chalmers "Slick" Goodlin was the primary Bell Aircraft test pilot of X-1-1 (serial 46-062). He made 26 successful flights in both of the X-1 aircraft from September 1946 until June 1947. The Army Air Force was unhappy with the cautious pace of flight envelope expansion and Bell Aircraft's flight test contract for aircraft #46-062 was terminated and was taken over by the Army Air Force Flight Test Division on 24 June after months of negotiation. Goodlin had demanded a US$150,000 bonus for breaking the sound barrier. Flight tests of the X-1-2 (serial 46-063) would be conducted by NACA to provide design data for later production high-performance aircraft. On 5 January, 1949, Yeager used Aircraft #46-062 to carry out the only conventional (runway) take off performed during the X-1 program, reaching 23,000 ft in 90 seconds. Aircraft #46-062 is currently on display in the Milestones of Flight gallery of the National Air and Space Museum in Washington, DC, alongside the Spirit of St. Louis and SpaceShipOne. Aircraft #46-063, now the X-1E, is on display in front of the NASA Dryden Flight Research Center headquarters building. Later variants of the X-1 were built to test different aspects of supersonic flight; one of these, the X-1A, with Yeager at the controls, inadvertently demonstrated a very dangerous characteristic of fast (Mach 2 plus) supersonic flight: inertia coupling. Only Yeager's skills as an aviator prevented him from dying that day; later Mel Apt would die testing the Bell X-2 under similar circumstances. Ordered by the Air Force on 2 April 1948, the X-1A (serial 48-1384) was intended to investigate aerodynamic phenomena at speeds above Mach 2 (681 m/s, 2,451 km/h) and altitudes greater than 90,000 ft (27 km), specifically focusing on dynamic stability and air loads. Longer and heavier than the original X-1, with a bubble canopy for better vision, the X-1A was powered by the same Reaction Motors XLR-11 rocket engine. The aircraft first flew, unpowered, on 14 February 1953 at Edwards AFB, with the first powered flight on 21 February. Both flights were piloted by Bell test pilot Jean Ziegler. 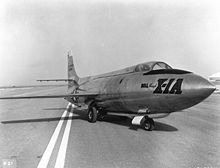 After NACA started its high-speed testing with the Douglas Skyrocket, culminating in Scott Crossfield achieving Mach 2.005 on 20 November 1953, the Air Force started a series of tests with the X-1A, which the test pilot of the series, Chuck Yeager, named "Operation NACA Weep". These culminated on 12 December 1953, when Yeager achieved an altitude of 74,700 feet (22,770 m) and a new air speed record of Mach 2.44 (equal to 1620 mph, 724.5 m/s, 2608 km/h at that altitude). Unlike Crossfield in the Skyrocket, Yeager achieved that in level flight. Shortly after, the aircraft spun out of control, due to the then not yet understood phenomenon of inertia coupling. The X-1 dropped from maximum altitude to 25,000 feet (7,620 m), exposing the pilot to accelerations of up to 8g, during which Yeager broke the canopy with his helmet before regaining control. The aircraft was transferred to NACA in September 1954. Following modifications, including the installation of an ejection seat, the aircraft was lost on 8 August 1955 while being prepared for launch from the RB-50 mothership, becoming the first of many early X-planes that would be lost to explosions. The X-1B (serial 48-1385) was equipped with aerodynamic heating instrumentation for thermal research (over 300 thermal probes were installed on its surface). It was similar to the X-1A except for having a slightly different wing. The X-1B was used for high speed research by the US Air Force starting from October 1954 prior to being turned over to the NACA in January 1955. NACA continued to fly the aircraft until January 1958 when cracks in the fuel tanks forced its grounding. 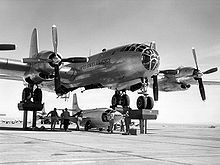 The X-1B completed a total of 27 flights. A notable achievement was the installation of a system of small reaction rockets used for directional control, making the X-1B the first aircraft to fly with this sophisticated control system, later used in the X-15. The X-1B is now at the National Museum of the United States Air Force, Wright-Patterson Air Force Base at Dayton, Ohio, where it is displayed in the Museum's Research & Development Hanger. The X-1C (serial 48-1387) was intended to test armaments and munitions in the high transonic and supersonic flight regimes. 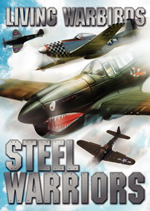 It was canceled while still in the mock-up stage, as the birth of transonic and supersonic-capable aircraft like the North American F-86 Sabre and the North American F-100 Super Sabre eliminated the need for a dedicated experimental test platform. 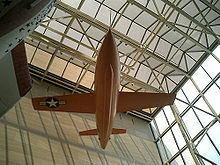 The X-1D (serial 48-1386) was the first of the second generation of supersonic rocket planes. Flown from an EB-50A (s/n #46-006), it was to be used for heat transfer research. The X-1D was equipped with a new low-pressure fuel system and a slightly increased fuel capacity. There were also some minor changes to the avionics set. On 24 July 1951, with Bell test pilot Jean Ziegler at the controls, the X-1D was launched over Rogers Dry Lake, on what was to become the only successful flight of its career. The unpowered glide was completed after a nine-minute descent, but upon landing, the nose gear failed and the aircraft slid ungracefully to a stop. Repairs took several weeks to complete and a second flight was scheduled for mid-August. On 22 August 1951, the X-1D was lost in a fuel explosion during preparations for the first powered flight. 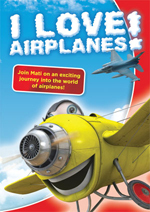 The aircraft was destroyed upon impact after it was jettisoned from its EB-50A mothership. Picture - Bell X-1-3, aircraft #46-064, being mated to the B-50 mothership for a captive flight test on 9 November 1951. While being de-fueled after this flight it exploded, destroying itself and the B-50, and seriously burning Joe Cannon. X-1-3 had only completed a single glide flight on 20 July. The X-1E was the result of a reconstruction of the X-1-2 (serial 46-063), in order to pursue the goals originally set out for the X-1D and X-1-3 (serial 46-064), both lost in explosions in 1951. The cause of the mysterious explosions was finally traced to the use of Ulmer leather gaskets impregnated with tricresyl phosphate (TCP), a leather treatment, which was used in the liquid oxygen plumbing. TCP becomes unstable and explosive in the presence of pure oxygen and mechanical shock. This mistake cost two lives, caused injuries and lost several aircraft. 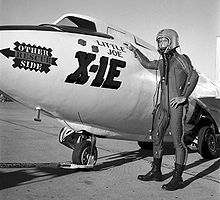 Picture - The X-1E, christened ‘Little Joe’, with pilot Joe Walker. A re-profiled super-thin wing (3+⁄8 inches at the root), based on the X-3 Stiletto wing profile, enabling the X-1E to reach Mach 2. A 'knife-edge' windscreen replaced the original greenhouse glazing, an upward-opening canopy replaced the fuselage-side hatch and allowed the inclusion of an ejection seat. The X-1E first flew on 15 December 1955, a glide flight under the controls of USAF test pilot Joe Walker. Walker left the X-1E program in 1958, after 21 flights, attaining a maximum speed of Mach 2.21 (752 m/s, 2,704 km/h). NACA research pilot John B. McKay took his place in September 1958, completing five flights in pursuit of Mach 3 (1,021 m/s, 3,675 km/h). before the X-1E was permanently grounded following its 26th flight, in November 1958, due to the discovery of structural cracks in the fuel tank wall.